The wise guys keep buying the dips owing to the simple proposition that there is never a lasting bear market without a recession. So after today's blow-out we are likely to get another call to scoop up the "bargains" because the correction has run its course and the US economy is still chugging along notwithstanding the contretemps in China and other places of purportedly limited moment. Indeed, on the basis of Wall Street's muscle memory alone there is surely another dead cat bounce on its way any day. But here's the memo. BTFDs is not working any more and, more crucially, there is a recession coming and soon. And then the bear will maul, not simply paw as today. The fact is, BTFD hasn't worked on a net basis hasn't for about 730 days now. 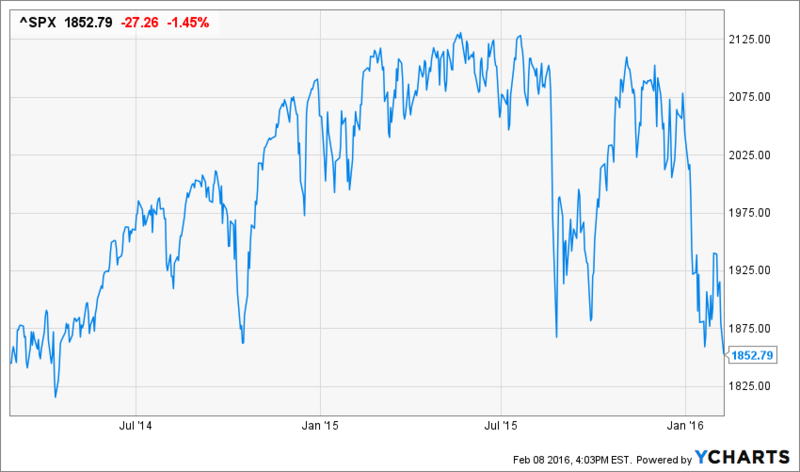 The S&P 500 closed today where it first crossed in February 2014. In light of this extended dwell time in no man's land, it is not surprising that the market is getting spooked. After all, the real driver of the post-March 2009 rebound of the stock indices was the Fed's massive intrusion in money and capital markets, not a sustainable recovery of main street business activity or real household incomes. Real net CapEx is still below 2007 levels, for example, as is the real median household income. And most certainly the market's 220% gain between the post-recession bottom of 670 and the May 2015 peak of 2130 was not owing to an explosion of corporate earnings. If you set aside Wall Street's annually renewable ex-items hockey stick, what you actually have on the profits front is a paltry 8% cummulative gain since the pre-crisis earnings peak way back in June 2007. That's right. S&P earnings on an honest GAAP reported basis peaked at $85 per share in the LTM period for June 2007, and posted at just $90.66 during Q3 2015; and based on Q4 filings to date, are certain to be down another dollar or two per share in the current quarter. 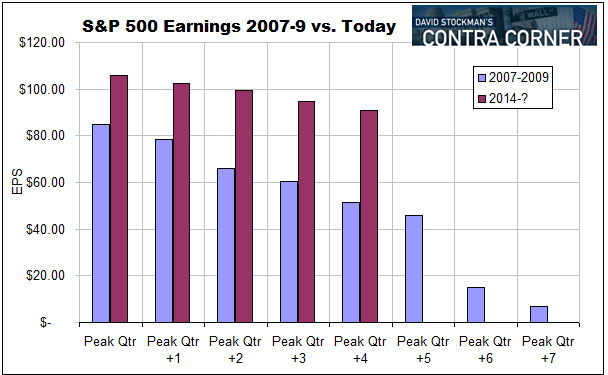 Thus, based on the most recent reporting, S&P 500 earnings are off by 14.4% from the current cycle's peak, thereby replicating the exact pattern which occurred during the 2007-2009 collapse. While the Wall Street hockey sticks were projecting earnings of $120 per share or more for 2008, actual GAAP earnings starting falling after the June 2007 LTM period, and kept plunging until they hit bottom at $7 per share in June 2009. The blue bars mark the death throes of a dying bull last time. Self-evidently, this bull market—marked in red—– is not far behind. The reason, of course, is that a recession is coming. As I suggested in debunking another phony jobs report from the BLS last Friday, the world would be far better off if they simply shutdown the BLS. Adding up minimum wage gigs a few hours per week with full time employment slots in a factory, as per the establishment survey, is a completely stupid, useless and profoundly misleading waste of time. If we need aggregated data on employment trends, the US government itself already publishes a far more timely and representative measure of Americans at work. It's called the treasury's daily tax withholding report, and it has this central virtue: No employer sends Uncle Sam cash for model imputed employees, as does the BLS in its trend cycle projections and birth/death model; nor do real businesses forward withholding taxes in behalf of the guesstimated number of seasonally adjusted payroll records for phantom employees who did not actually report for work. Stated differently, the daily tax withholding report is the real thing and the whole thing; it captures the labor input of the entire US economy in real time, and does not get revised and manipulated endlessly over the course of months and years from its original release. Now it is strongly pointing to recession dead ahead. As I indicated in the last post, my colleague Lee Adler has been tracking the daily withholding reports for more than a decade and knows their details and rhythms inside-out. He now reports that tax collections are swooning just as they always do when the US economy enters a recession. 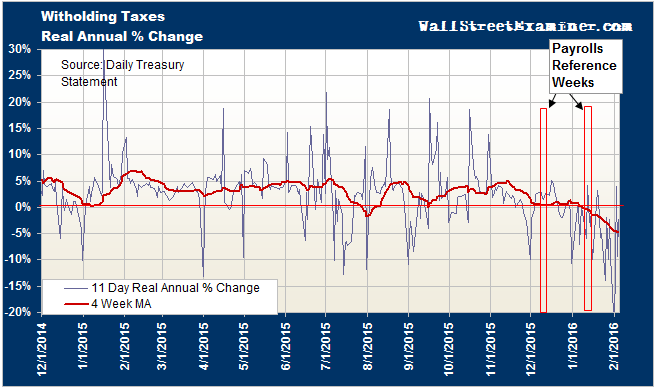 "The annual rate of change in withholding taxes has shifted from positive to negative. It has grown increasingly negative in inflation adjusted terms for more than a month. Following on the heels of a weak December, it is a clear sign that the US has entered recession........the implied real growth rate is now roughly negative 4.5% per year......it is the most negative growth rate since the recession. It follows the longest stretch of zero growth in several years, This can no longer be considered temporary or an anomaly. It has all the earmarks of a trend reversal and is getting worse." Needless to say, the starting point for overcoming the casino's blind spot with respect to the oncoming recession is to recognize that payroll jobs as reported by the BLS are a severely lagging indicator. Here is what happened to the headline jobs count in just the 12 months after May 2008. The resulting 4.6% plunge would amount to a nearly a 7 million job loss from current levels. In the next installment we will review the reasons why Keynesians and Wall Street bulls cannot see the recession coming, starting with the phony notion of the oil tax cut. But here is a hint. Last year the US economy consumed 19.37 million barrels per day (mb/d) of petroleum products, but produced 13.74 mb/d of petroleum liquids. The latter included 3.26 mb/d of natural gas liquids and nearly 1 mb/d of ethanol on top of 9.43 mb/d of crude oil. So net imports were only 5.63 million mb/d or just 29% of consumption. And that's the starting point for the so-called oil tax cut. To wit, the nation's annual net import volume was about 2 billion barrels. Accordingly, every $10 of lower oil prices amount's to just 0.1% of GDP or the equivalent of $3.25 per week for each US household. On the pure math of it, that doesn't make for an economic bonanza, but the story is actually far worse. Next we will consider the F-150 indicator to explicate the reasons why.